choir croak out them goodies: Fleet Foxes! The obsession with hippie culture and ‘60s folk that’s been simmering over the last couple of years is peculiar and cultish, a bit Manson, no? Seattle’s Fleet Foxes are a blatant nod to the nature lovers of yesteryear, on one hand, yet barely-legal front man Robin Pecknold will defend, at any chance, his opposition to the ironic consumerism in hippie culture, and the fact that he – adorned with the face of Jesus – is no hippie. The band’s style is far too lumberjack for such a title, anyway. Pecknold himself has a gorgeous voice, elegant on its own but suited to harmonize with his band mates, like on “White Winter Hymnal,” a neo-traditional effort suited to a…erm…white winter. His voice stands out as beautifully as the rhythmic lead guitar or tom drums on “Ragged Wood,” which is broken up into parts and at first marches steadily like the Constantines’ “Soon Enough” did three years ago. “He Doesn’t Know Why” sees a baroque atmosphere created from tumbling drum rolls and piano steps, before ending on a thirty-second piano solo that could and should be its own stunning track, if only it were built upon. This full-length debut is too complex, layered and musically representative of moods and winter visions to be passed off as trendy hippie fare. 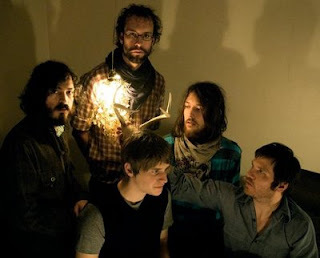 Pecknold revealed via his label that “We’ve succeeded for ourselves if we’ve made a song where every instrument is doing something interesting and melodic.” This standard in place, Fleet Foxes have more than succeeded. I hear that seeing Fleet Foxes live is quite the mindblower of an experience. I refuse to miss them this time around. ALso, new blog. Out with the old stupid name, in with the new awesome name. I have high hopes for their live show. A man resembling Jesus has a lot to live up to. "white winter hymnal" is one of the most amazing things i've heard all year. i bought tix to see them in sf after hearing only that song. Definitely agree there...I swooned so much during even the first listen to that song. I envy that you get to see them in SF, though.